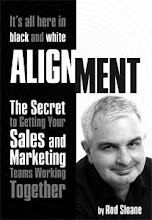 Sales and Marketing Alignment Blog from Rod Sloane: How to Respond in Uncertain Times. I don't know about you, but this week the words of that dour Scot from Dad's Army, Private Fraser have been ringing in my head "We doooomed!" The media love to tell us how bad things are, how the party's over and we will soon all be working by candlelight. Well, for one, I say they're wrong. You and I run our own small business. The politicians are not in control. You and your clients are in control. Come on, I think it's time to get back to basics especially with your marketing. It's time to discard all your old prejudices and fears. Time to consider what really works. What really works for example is direct mail. For every £1 spend on direct mail, expect a £4 response. Don't take my word for it, pop over to the Direct Mail Information Service http://www.dmis.co.uk/ and download their free report.